From December 8, 1941 until mid November 1945, Oahu was under martial law. All efforts were focused on winning the war in the Pacific Theater. Major Army and Marine training bases were built on Maui and Hawaii. Interisland ships and the seaplanes of Pan American Airways were pressed into service for the U.S. Navy. Inter-Island Airways flew its three DC-3s only during the day and only to specific neighbor islands with the permission of military authorities at the Army-Navy Transport Command and Naval Air Station Honolulu at what would become Honolulu International Airport. 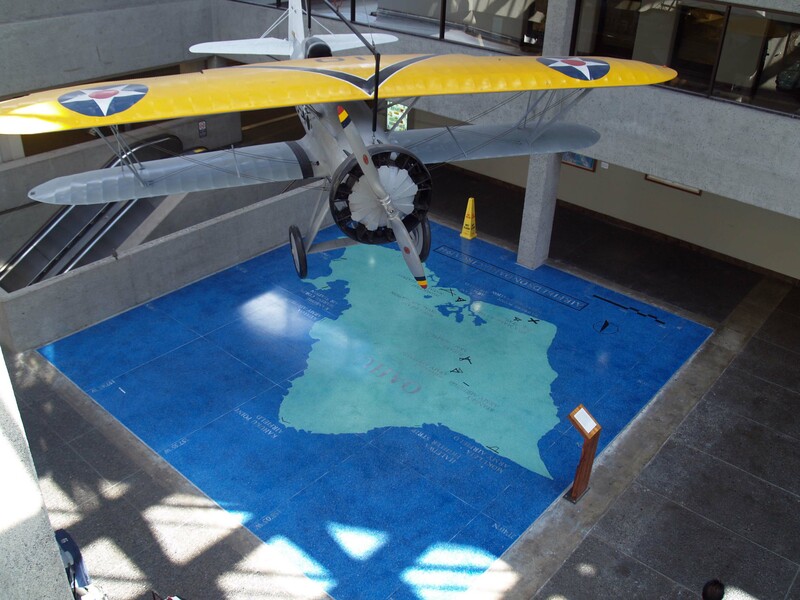 Shown on the map in this terrazzo tile floor are the 15 airfields or emergency landing airstrips which existed on Oahu in 1944. There were also seaplane landing areas at Kaneohe Bay, Pearl Harbor and Keehi Lagoon. There may have been as many as 2,000 aircraft on this island at the height of WW II. One of the men who flew over Oahu in 1944 was Charles A. Lindbergh, probably the most famous aviator in the 20th Century. From 1938 to 1941, Charles Lindbergh was a primary speaker for the America First Movement which was against involvement in another war in Europe. Many prominent American businessmen and legislators were involved in this movement including former President Herbert Hoover. Lindbergh had been a colonel in the Army Air Corps Reserve but resigned in protest. After December 7, 1941, President Franklin D. Roosevelt would not let Lindbergh back into the Army, so Lindbergh went to work for the Ford Company as a technical aviation advisor for its B-24 plant at Willow Run, Michigan. He flew almost every military aircraft in the U.S. inventory, influenced design of the B-24, P-47, F4U, P-38, P-39 and P-40, worked with Consolidated and Vought Aircraft Companies, volunteered to be a guinea pig for tests on oxygen starvation at high altitudes and eventually flew combat missions in the Pacific Theater. His forte was teaching pilots how to conserve fuel. “I have had no chance to see anything of the island yet – except from the air. The surf looks wonderfully inviting, and I would like to get up into the mountains on foot. even on the faces of the precipices. No surface seems to be too steep for this growth to cling to, whatever it may be. After WW II, Charles Lindbergh continued as an advisor to Pan American World Airways and had a hand in the development of the B747. He had a vacation home beyond Hana, Maui and was buried in Hana when he died. The Lone Eagle had a connection with Hawaii which involved aviation but perhaps soothed his intense intellectual curiosity and facilitated his writing. Today there are active airfields left at Honolulu International/Hickam Air Force Base, Wheeler, Kaneohe, Barbers Point/Kalaeloa and Dillingham/Mokuleia.